Through the years, my setup has actually gotten simpler instead of more complicated. Some things though haven’t changed. Of course I play with tracking software and a HUD. 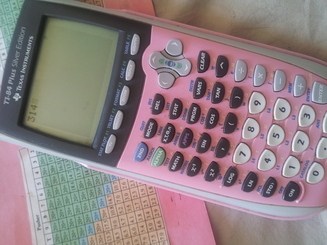 My pink TI-84 calculator has been with me almost from the beginning— it was a Christmas gift from Collin many years ago, and in terms of usability and cuteness it is one of the best presents I’ve ever received! Most days I’ll only use it a couple of times, such as when I’m deep in a tournament and want to accurately adjust for the ante in close spots. I also have a colorful printout of the HoldemResources.net Heads Up Nash Equilibrium chart, which I use mainly to aid my close calling decisions. I bet that my high school math teachers would be shocked to hear that I consider a graphing calculator one of my most important work tools! I used to play with more charts, but as the years went by I had them down cold and more and more I’m playing exploitively. Playing with charts can be a great tool, but if one doesn’t often stray from unexploitable ranges then they’re likely missing out on profit (especially at the mid-stakes that I play). To counter my not playing with the charts I used to, I spend a great deal more time studying than I used to. Other items I keep around me when I play are: a giant bottle of water, some almonds, and extra batteries for my wireless mouse. While some people like a more substantial mouse, I’ve found that I prefer small mouses designed for laptops, because they fit well in my hand and are easier to zip around the screen. Which is a bit too college-dorm like for my tastes these days! But I really miss my Herman Miller chair. It made the trip on the move to Vegas, but when we moved to Mexico, we sold/donated all of our furniture. Somewhere, someone owns that chair now, oblivious to the fact that I played more than a few million hands of poker in it! As for hardware, I’ve gone through more than my fair share of computers. 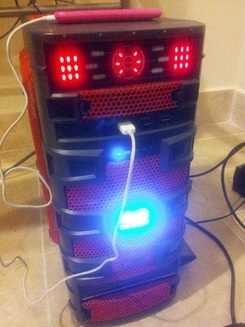 Right now I have a high performance gaming machine, which is proving to be worth the investment. I’ve always prioritized updating my tower over monitors. 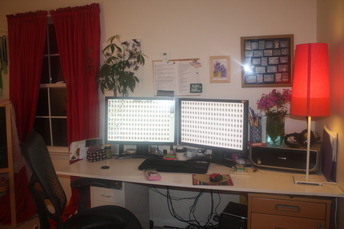 My dream setup would be playing on two 30” monitors, so that I didn’t have to overlap my tables when I have 30 games running— but I’d also need a bigger desk for that. My next upgrade will likely be whatever the best chair is at the Rosarito Office Depot…and more size XL poker clothing for Wilbur.